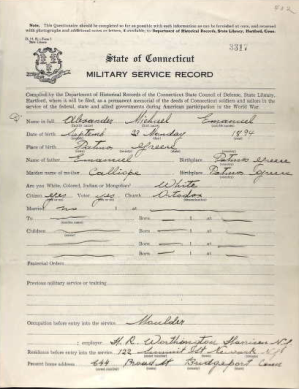 Ancestry.com has a database titled CONNECTICUT, MILITARY QUESTIONNAIRES, 1919-1920. There are 72 men, born in Greece, who filled out this questionnaire. You are so lucky if one of your ancestors filled out this 4 page form with precious information about why they fought and their feelings about service. You will be able to view the entire 4 page form online.